This was an easy one. Life could hardly have done better this week, defeating Maru and Cure to secure a 3-2 win for his team against one of the Proleague favorites, Jin Air. As Cure had a 3-game win streak prior to the ace match, Life earned a ninth point to put the icing on the cake. Life's also the second most owned player, which means the wealth was spread around significantly. Everyone did too well this week, just like last week. Like Cure, Zest secured a three win streak by destroying Shine to earn an extra point, but he also followed up this performance with a perfectly clean dismantling of Solar in the ace match. 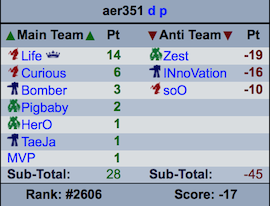 This gave even more value to Zest than one might expect, as a fair number of people also had Solar in their anti-team. Zest's not the player of the week because only 263 people (about 1/10) owned him compared to the 818 people that chose Life. Bbyong also won twice for his team, as he was fielded in the ace match in addition to the regular one. Maybe fewer people would contend for this award if every match didn't go to the ace (except some involving Prime). As usual, Bbyong has surpassed expectations once again to become one of the most valuable FPL players despite costing just $6 at the outset of the season. However, all Bbyong did was beat MarineKing, who has sharply fallen back to his normal form, twice. Cure is the only player on more teams than Life, which is amusing because I only picked him since he seemed like a dark horse. Although he only earned three points, Cure took a strong victory against San and was fielded in the ace match, only losing because he had to face the ZvT maestro in Life. Expect to see more out of him. Solar could potentially be the only player ever to end a round of FPL with 0 points or fewer, even if his team wins another series The only person I can recall that ever nearly accomplished this was his teammate Shine, who earned two points due to team victories in the very last week of the first round of the 2012-13 Proleague to finish at +1. Right now, Solar is 0-4, including two horrible losses in ace matches against Bbyong and Zest. This is a huge boon for those 139 players who put the Samsung Zerg, who cost $8 at the outset of the season, on their anti-team. The 51 people who have found him stuck on their main team (20 traded for him!) are probably very disappointed with this, however. 99 people traded for TY last week, anticipating an easy victory against Guilty. Even I uncharacteristically traded for TY, after calculating that he was most likely to give me good value. Although I was not disappointed in my loss, lots of other people were. Including the 99 people who opted to trade away sKyHigh, Stats, Cure, Leenock, or Life (! ), over 500 people had bought TY stock and found themselves extremely irritated at the Samsung rookie. Additionally, Guilty was the fourth least bought player, the three below him being Ssemi, Vanilla, and Nette. After identical openers from both players, Guilty took control of the game and slowly threw it away, making both of them look rather bad in the process, before quickly outmacroing and crushing the KT Terran. Simply losing to a debuting rookie in TvT casts doubt on TY's value as a player in FPL, and we have no idea if Guilty will ever be fielded again, since Samsung has drastically changed the lineup every week. If you would like to join Guilty's fan club, post here. Haha Flash, you lost again. Flash differs from Solar in two important ways. First of all, he's not played in the ace match. This means that his continuous streak of losses doesn't actually reduce his score, so he's at least a little value for those unfortunate enough to own him. Additionally, lots of people own Flash- over 300, and only a few people have him on the anti-team. Currently, Flash's value is between sKyHigh and Classic, so you may want to trade him before it becomes lower than that of TANGTANG. Picking a $3 or 4 player as your captain takes serious guts. Generally, the most effective strategy when picking a captain is to either pick a high-value player you have absolute confidence in winning over and over (INnoVation), a mid-value player that you can reasonably expect to get fielded just about every match (Cure, TY, YoDa), or a worthless player so that you can trade all of your important players without restriction (TerrOr or Guilty ). Even though BrAvO was fielded in week one, Samsung's unusual and unpredictable lineup made it unclear whether he'd ever provide value. Perhaps he could be traded for a B-teamer on a lesser team if things didn't work out week one. 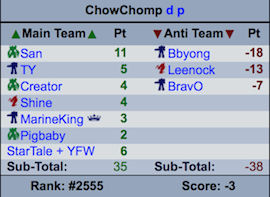 However, wins against Bbyong and Flash have made him worth seven points, and make it more likely that he'll get fielded to snipe someone in TvT. Of course, the rest of Knecht's team is about as good as it can get. He has three of the six players that made it to the ace match, and could only be better off in that regard if he somehow had Bbyong instead of Cure. 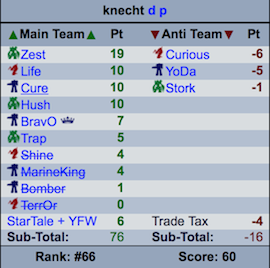 Hush and Trap additionally ended up being farsighted picks, as both of them picked up wins against their rather lackluster opponents in Seed and aLive well after knecht picked them. Technically, Endoyo lost one more point, but this was by virtue of having an anti-team costing $21, so he was disqualified. ChowChomp's story is a tragic one. Almost all of his players were actually in the lineup this week and could have won their games. Yet, San lost to Cure, TY lost to Guilty, Shine lost to Zest, his captain MarineKing lost twice to Bbyong, and his remaining players (Pigbaby and Creator), didn't even play. Meanwhile, everyone on his anti-team won at least once, which gave him a whopping -12 in week 4. Had things gone a bit differently, he might have won in excess of 25 points this week. Not much to say here, except Solar is now -1 instead of 0, so a "perfect" anti-team is possible. However, last week I pointed out that "nobody found the Creator/Solar/TANGTANG anti-team and switched Creator to MyuNgSiK this week, a series of actions that would have netted -0 including the trade tax." This is still otherwise true, so it would lead to a net +1. Seriously, why would you put the two best SKT players and Zest on your anti-team? He doesn't even seem to be trying to lose either, as his main team is fairly normal. Note: I did this by hand, let me know if a better team is possible. Fun fact: this would be 3rd place in the week 4 ranking. I'm Guilty of trading for TY and Flash myself. Oh, and the "perfect" anti-team can actually be seen in the best team with trades at the bottom. It actually involves three prime players and Solar. Counting the trades you get a net +1.